"Lake Village" redirects here. For the town in Indiana, see Lake Village, Indiana. Lake Village is a city in Chicot County, Arkansas, United States. The population was 2,575 at the 2010 census. 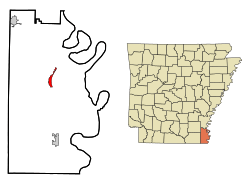 The city is the county seat of Chicot County. Lake Village is named for its location on Lake Chicot, an oxbow lake formed from the Mississippi River. According to legend, the remains of Hernando de Soto might be buried under Lake Chicot. See List of sites and peoples visited by the Hernando de Soto Expedition. Charles Lindbergh made his first nighttime flight over Lake Chicot and Lake Village in April 1923. Lake Village has nine properties listed on the National Register of Historic Places: Carlton House, Chicot County Courthouse, Sam Epstein House, Gregory Dipping Vat, Lake Village Commercial Historic District, Lake Village Confederate Monument, Lake Village Post Office, Dr. E.P. McGehee Infirmary, New Hope Missionary Baptist Church Cemetery (Historic Section), and the John Tushek Building. The nearby Lakeport Plantation is also listed. Lake Village is located north of the center of Chicot County at (33.331592, -91.283497). It is situated on the west bank of Lake Chicot, a former course of the Mississippi River and now an oxbow lake. U.S. Routes 65 and 82 pass through the city. US 65 leads north 22 miles (35 km) to McGehee and south 17 miles (27 km) to Eudora, while US 82 leads west 31 miles (50 km) to Hamburg and east 21 miles (34 km) to Greenville, Mississippi. U.S. Route 278 follows US 65 north out of town and US 82 east to Mississippi. According to the United States Census Bureau, Lake Village has a total area of 2.5 square miles (6.4 km2), all land. 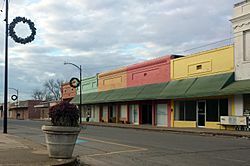 The city sits in the southernmost section of the Delta Lowlands of Arkansas and boasts beautiful scenic vistas of the Mississippi River. As of the census of 2000, there were 2,823 people, 1,090 households, and 705 families residing in the city. The population density was 1,357.7 people per square mile (524.0/km²). There were 1,233 housing units at an average density of 593.0 per square mile (228.9/km²). The racial makeup of the city was 40.74% White, 56.15% Black or African American, 0.21% Native American, 1.13% Asian, 0.57% from other races, and 1.20% from two or more races. 1.38% of the population were Hispanic or Latino of any race. There were 1,090 households out of which 33.9% had children under the age of 18 living with them, 36.6% were married couples living together, 24.2% had a female householder with no husband present, and 35.3% were non-families. 32.6% of all households were made up of individuals and 15.1% had someone living alone who was 65 years of age or older. The average household size was 2.49 and the average family size was 3.16. In the city, the population was spread out with 29.3% under the age of 18, 8.0% from 18 to 24, 25.5% from 25 to 44, 19.7% from 45 to 64, and 17.5% who were 65 years of age or older. The median age was 36 years. For every 100 females there were 79.9 males. For every 100 females age 18 and over, there were 71.0 males. The median income for a household in the city was $20,625, and the median income for a family was $28,438. Males had a median income of $37,031 versus $14,872 for females. The per capita income for the city was $12,677. About 29.1% of families and 36.1% of the population were below the poverty line, including 49.6% of those under age 18 and 24.5% of those age 65 or over. In June 2008, construction was completed to convert the two-lane combined highway of 82, 65 and 278 inside of the city limits of Lake Village into a four-lane highway, with an added stoplight and sidewalks on both sides of the road. There has been no indication of whether plans for widening the highway further south to the Greenville Bridge over the Mississippi are still viable, or when construction might begin. Lake Village, Arkansas Facts for Kids. Kiddle Encyclopedia.